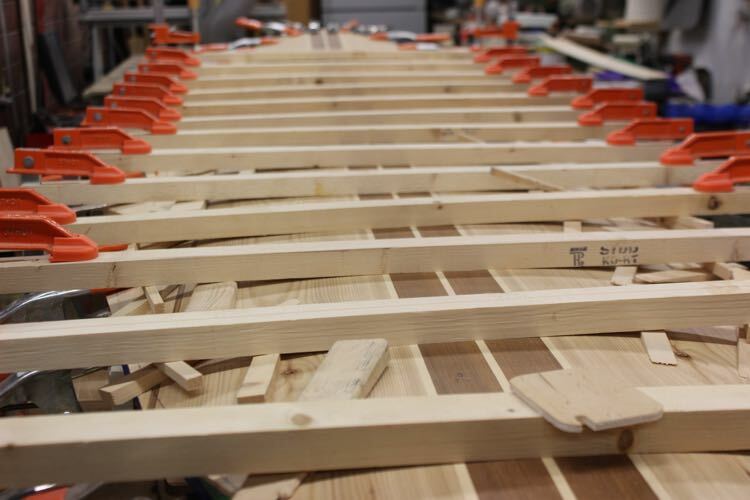 The next step in building a hollow wooden SUP kit is attaching the top panel. As a professional builder, I have a lot of clamps but you do not need walls of clamps to do this step. Customers have successfully completed this step with only webbing straps and tape. ( No Clamps No Problem) This tutorial demonstrates attaching the top panel using thickened epoxy since the inside of this board is sealed. If you are building a board without sealing the inside, you can use Titebond 3 on the feathered edge and Pl Premium or 3M 5200 on the ribs. The rails should be complete with a feathered edge and a nicely taped transition line. The First step is to lay the top on the board and trace the outline on your top skin and then trim the panel so that it is no more than 1 inch larger than is required. Any extra material that cantilevers over the transition from the top panel increases the chance of the panel cracking. 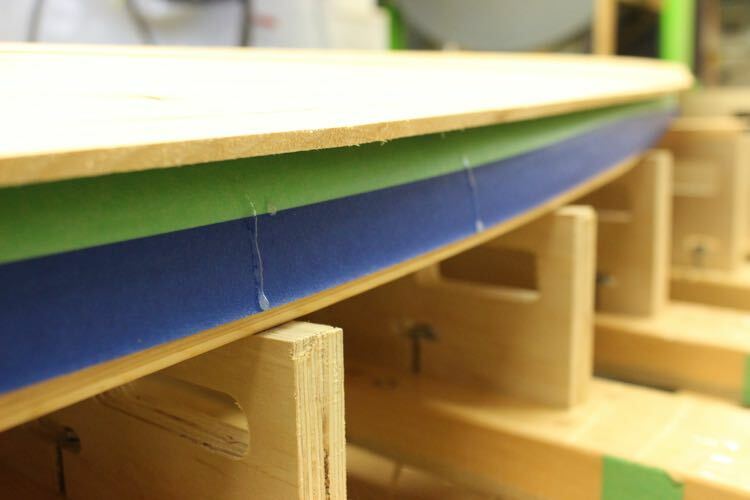 If the panel is sealed it should be scuffed first with 60-grit sandpaper to increase the mechanical bonding strength. 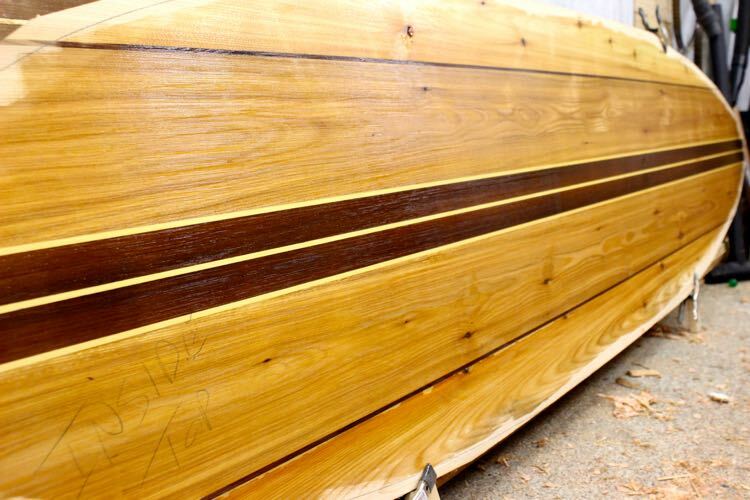 You can remove the sanding residue by giving the panel a wipe with denatured alcohol. The flat feathered edge can be coated with a 1″ chip brush or a small stick. 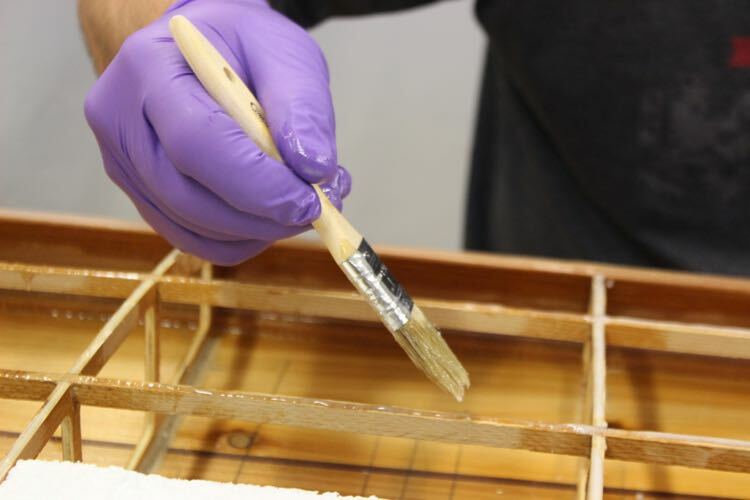 The stick can be used like a squeegee to keep the thickened epoxy on the wood and off the tape. Working with thickened epoxy is nice as it behaves much like honey. Keep adding the thickened epoxy to the middle of the transition area and then spread it evenly with the stick or chip brush. An irrigation syringe is the easiest tool to use on the fishbone if you are using epoxy. The syringe can be refilled directly out of the mixing bucket by pulling a vacuum. PL Premium and 3M 5200 can be used right out of the tube but it might be worth the effort to fill a syringe to increase the dexterity. A final check with a chip brush or finger to push any sags back up on the ribs as well as checking that you didn’t miss any ribs. Drips on the bottom skin should be smeared or cleaned up just to make sure they don’t break free and rattle inside the board. 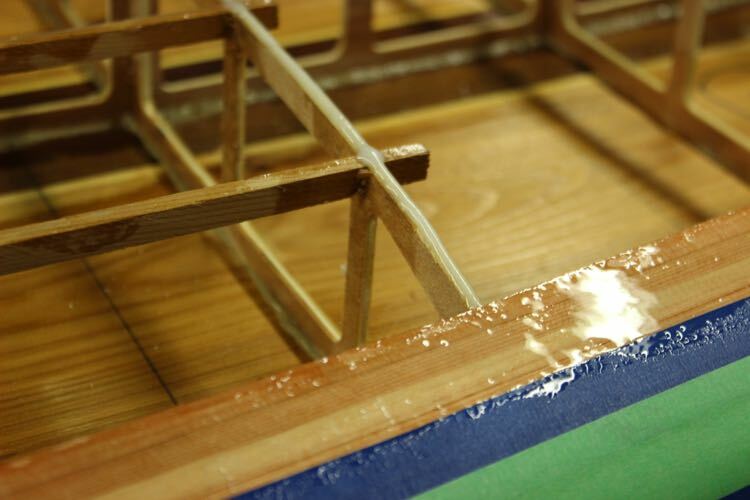 Carefully lay the top skin on the fresh epoxy. The best way is to have a helper align the nose or tail and then slowly lower your end into place. You really want the top to sit on the epoxy and not to have to wiggle it around too much as it will smear the epoxy out of place. Once the alignment is perfect you should place a spring clamp on one end to lock it in place. Have your helper flex the skin in the middle as you align the other side. Double check both ends before starting with the strong-backs. A layer of tape will protect the mostly finished rail from drips. Only the top edge of this tape is pressed tight and the bottom is hanging loose as a drip edge to prevent drips from running onto the bottom. Starting in the middle, work towards the ends placing the strong backs. It is nice to have a friend help with this step so they can mirror your efforts. If you work efficiently you can do this alone but there will be less smiling as it feels more stressful. Once all the strong-backs are in place do a final check that the top panel hasn’t shifted out of alignment before inserting the wedges. 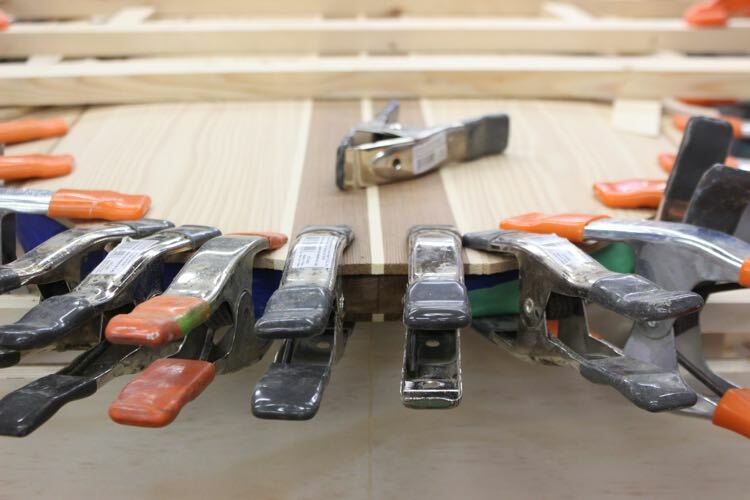 It is best to start in the centre and work towards the rails to allow the top panel to relax into the desired curve. I insert the wedge closest to the centerline for the whole length of the board and then come back and insert the wedges close to the rail (shown). 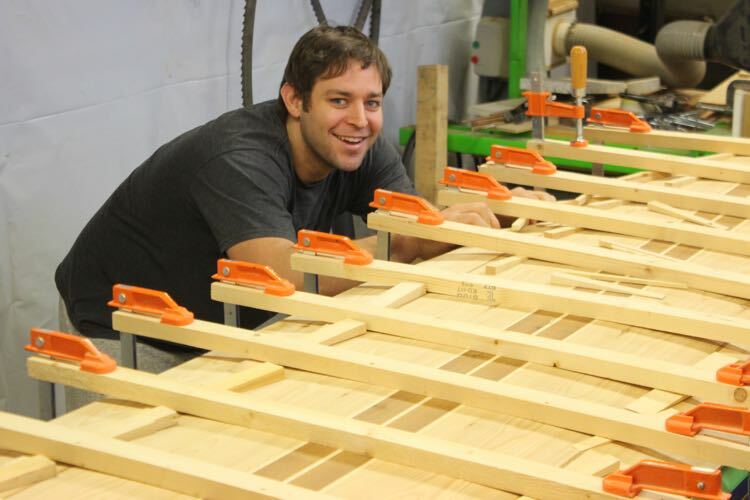 This order has the panel already bending in the right direction and allows time for the wood fibers to relax. Work slowly by first pressing the panel with your hand and then inserting the wedge with the other hand. 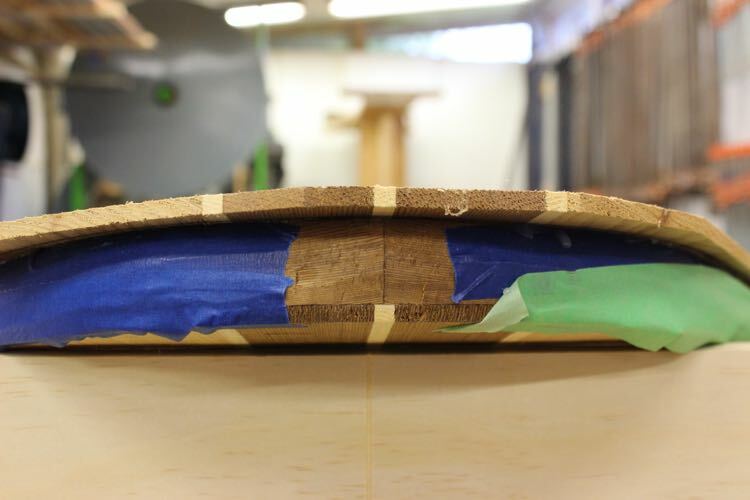 The key to having wood bend this much is working slowly with thin panels. This top was applied with no steam! The last thing to clamp is the nose and tail. Again working from the centre outwards slowly applying the clamps. 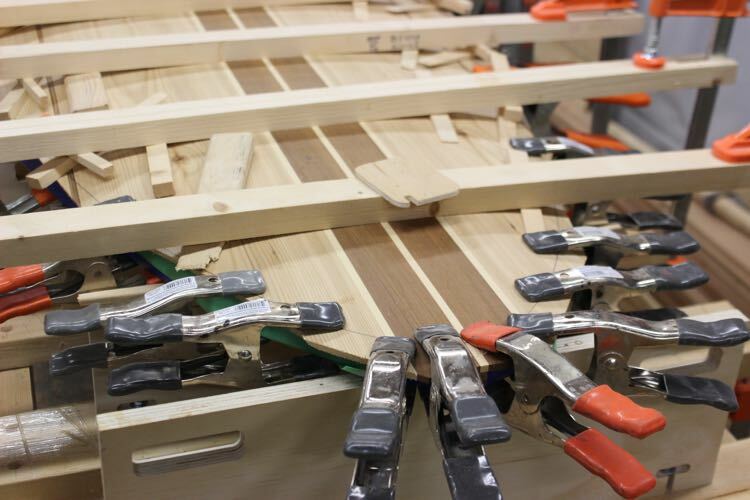 The close spacing between clamps reduces the chance of the panel cracking. The first clamp applied was removed to check the panels alignment. 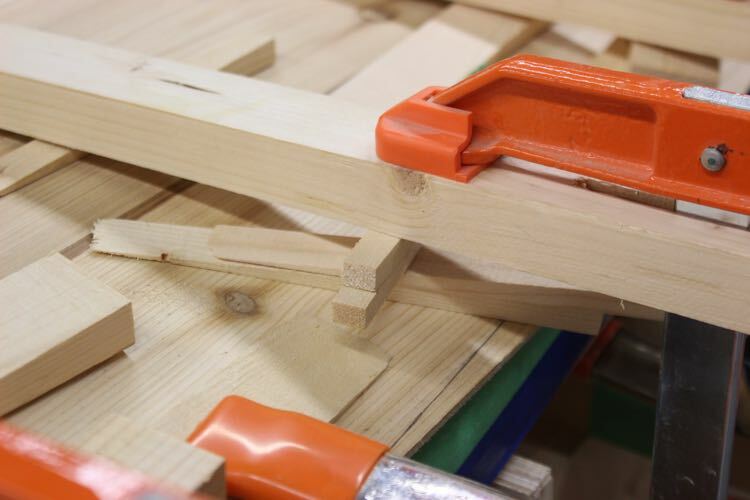 The last thing is to check between your clamps that the transition is tight. 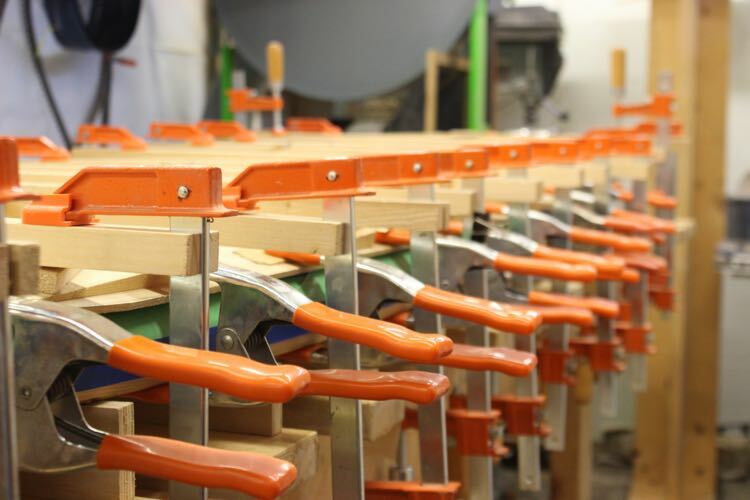 I have the luxury of having 3″ spring clamps that I add between the strong-backs. You can achieve the same results by adding strips of tape from the top panel to the bottom. This bit of pressure is to ensure the transition line is fair and not wavy.